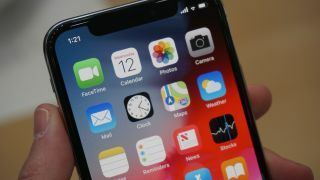 With most companies trying to minimize bezels and notches on their smartphones, it’s likely that Apple too will be looking at a way to shrink down the notch on future handsets such as the iPhone 11, and a new tech could help it do so. AMS (an Austrian company which provides Apple with optical sensors for the TrueDepth camera on the iPhone XS range) has announced a new optical sensor that can measure ambient light from behind an OLED screen. It also includes a proximity sensor that works from behind the screen. In Apple’s case that probably won’t happen, since the actual camera lens will still need to be put somewhere and we can’t see Apple opting for a pop-up system. But it could mean a significantly smaller notch, since many of the components wouldn’t need to be housed in it. Of course, just because this technology exists it doesn’t mean Apple will use it. The fact that AMS already supplies camera components to Apple makes it a distinct possibility but far from a done deal. There are any number of reasons Apple might choose not to. Perhaps it has found an alternate solution, or simply has issues with this one. Even if Apple does incorporate this new sensor into its phones, it might not do so for the iPhone 11 range, since it’s possible that this announcement has come too late for Apple to make the necessary changes. Still, it’s a promising sign that the big notch Apple currently relies on won’t be around forever and might not be around for much longer at all.